This project will implement a number of solutions to reduce clinical variability and length of stay (LoS) in acute adult mental health inpatient units. These include a new model of care, new care coordination and discharge process, new patient flow and demand management systems, enhanced consumer engagement, and workforce review and development. To improve access to acute mental health inpatient services, by reducing average LoS to 11 days, by December 2017. Reduces average LoS in acute adult mental health units. Improves access to acute adult inpatient mental health services. Improves coordination of care for acute adult mental health consumers. Enhances consumer and carer satisfaction. Increases productivity savings, which allows the service to better meet demand within existing resources. In 2014, following the de-amalgamation of Sydney and South Western Sydney Local Health Districts, the newly established SWSLHD Mental Health Service faced challenges in meeting the demand for acute mental health inpatient care. 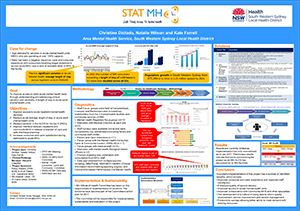 SWSLHD has one of the lowest bed bases per 100,000 population of any metropolitan local health district in NSW. Following the separation of services, it reduced access to specialist mental health beds, resulting in long hospital stays for some patients. Mental health beds in Bankstown-Lidcombe, Campbelltown and Liverpool Hospitals were used to address this demand, which meant consumers often had to travel long distances to receive care. Transfers between mental health units also meant there was no continuation of care for consumers. Data extracted from the Activity Based Management (ABM) portal in 2016 showed the SWSLHD acute average LoS had increased since 2013-14. At the time, the SWSLHD acute mental health average LoS was the third highest in NSW and the longest of any other metropolitan local health district in Sydney. There was significant variation in acute average LoS in SWSLHD, with Bankstown-Lidcombe at 11.56 days, Campbelltown at 15.54 days and Liverpool at 14.26 days in 2015-16. The average for SWSLHD was 14.26 days, compared to the NSW average of 11.27 days. Interviews, focus groups and surveys conducted with consumers, carers and clinicians identified a number of issues that contributed to variation in average LoS, impacting their experience of the service. Consumers and carers reported their experience of the service varied depending on what mental health facility they were admitted to. They also expressed dissatisfaction about long wait times when accessing acute mental health beds. Clinicians reported inconsistent practices and processes in the coordination of care, as well as a need to further define roles of each member in the multidisciplinary team. Research shows that clinical variation has a direct impact on LoS and quality of care delivered in acute settings. With no immediate plans to build additional mental health beds, the project focused on solutions that would standardise models of care and clinical processes across SWSLHD. The following solutions were developed in consultation with staff, consumers and carers, and will be implemented in 2017. A model of care for acute mental health services that will clearly define the consumer’s pathway and show how multidisciplinary teams support this journey to achieve standardised practice. A defined care coordination and discharge planning process and system to reduce average LoS. This will include standardisation of local multidisciplinary team meetings, establishment of interface meetings between community and inpatient mental health services and implementation of Mental Health Criteria Led Discharge1. A review of patient flow and demand management processes, to improve and standardise use of beds, strengthen direct ward admission processes from the community and reduce unnecessary transfers between wards and facilities. Enhance consumer and carer engagement, to standardise multidisciplinary rounding with consumers and implement regular patient and carer experience interviews. Support the clinical workforce by defining professional development pathways for mental health clinicians and refining practical training, clinical supervision, coaching and mentoring for staff. Acute Adult Mental Health Units at Bankstown-Lidcombe, Campbelltown and Liverpool Hospitals. 7-day follow-up rates post discharge. Maintaining a defined scope for the project is crucial to ensure solutions are targeted, specific and can be executed within realistic timeframes. Support from executive sponsors and the steering committee is critical. Engagement and consultation with key stakeholders is key to the success of the project. Agency for Clinical Innovation. Criteria Led Discharge: A resources to support the implementation of CLD. Chatswood: ACI; 2016.